"Treat people the way we would like to be treated." We are now a third generation company with Joe Ryan, Jr. joining us as our showroom manager. 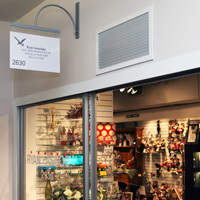 In the early 1970's, Joe Sr. and his wife, Phyllis Ryan, owned a Hallmark store on Brigantine Island, New Jersey. It was their logo. For sentimental reasons it will always be with us.